Orlando is the No. 3 U.S. Destination City according to the latest U-Haul migration trends report, rising one spot from its ranking on last year's list. Orlando is the No. 3 U.S. Destination City according to the latest U-Haul migration trends report, rising one spot from its ranking on last year’s list. The theme park mecca saw a substantial 14 percent year-over-year increase in one-way U-Haul truck arrivals in 2017 to become one of the three busiest cities for incoming traffic among do-it-yourself movers. "People move to Orlando for the beautiful weather, expanding job market and affordable housing," stated Miguel Caminos, U-Haul Company of Orlando president. "With more than 230 sunny days a year, Orlando is attracting more and more residents. It is one of the fastest growing metros in the U.S. because people realize how much fun the city is. We have amusement parks, entertainment districts, sports venues and a proud, unique culture." U-Haul has 12 Company-owned stores and 52 independent neighborhood dealers currently operating in the Orlando city limits. Find U-Haul truck and trailer sharing locations in Orlando at uhaul.com/locations. U-Haul International, headquartered in Phoenix, is counting down its top 10 U.S. Destination Cities as a prelude to Memorial Day weekend, the unofficial beginning of the summer moving season. About 45 percent of all moves each year occur between Memorial Day and Labor Day weekends. The No. 1 Destination City will be announced on May 25 via Twitter @uhaul and on myuhaulstory.com. Top 10 Destination Cities named thus far are: Columbus (10); Charlotte (9); Philadelphia (8); Austin (7); Las Vegas (6); San Antonio (5); and Brooklyn (4). Go to myuhaulstory.com to view Destination Cities 11-50. Other Florida locales to make the top 50 include Tampa (11), Jacksonville (14) and Miami (21) based on their incoming traffic in 2017. Rankings are based on the total number of arriving one-way U-Haul trucks into a city in the past calendar year. Destination Cities reflect the volume and regularity of do-it-yourself movers coming into a community. They do not account for departing one-way U-Haul trucks, and thus do not necessarily signify growth like U-Haul Growth Cities and Growth States rankings. U-Haul released its top 25 U.S. Growth Cities and its complete Growth States rankings for 2017 in January. 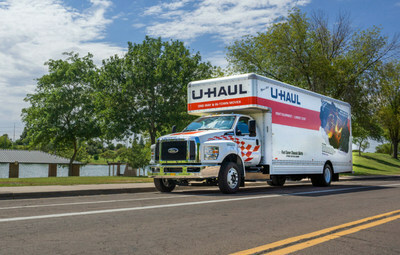 U-Haul is the authority on migration trends thanks to its expansive network that blankets all 50 states and 10 Canadian provinces. The geographical coverage from more than 21,000 U-Haul locations provides a comprehensive overview of where people are moving like no one else in the industry. Migration trends data is compiled from more than 1.7 million one-way U-Haul truck rental transactions that occur annually. The arrival of U-Haul Truck Share 24/7® is revolutionizing the moving industry through its more convenient, more secure way to pick up and return a truck. U-Haul live verification technology allows transactions to be carried out entirely on a smartphone at any hour – day or night. There are no membership fees. Download the U-Haul app or go to uhaul.com to create an account. About U-Haul: Since 1945, U-Haul has been the No. 1 choice of do-it-yourself movers, with a network of more than 21,000 locations across all 50 states and 10 Canadian provinces. U-Haul Truck Share 24/7 now offers customers access to U-Haul trucks every hour of every day through the self-service options on their internet-connected mobile devices. U-Haul customers' patronage has enabled the U-Haul fleet to grow to more than 150,000 trucks, 112,000 trailers and 40,000 towing devices. U-Haul offers more than 581,000 rooms and more than 51 million square feet of self-storage space at owned and managed facilities throughout North America. U-Haul is the largest installer of permanent trailer hitches in the automotive aftermarket industry and is the largest retailer of propane in the U.S.